My school's seminary has started a social media challenge to help spread our testimony about Jesus Christ and we're inviting you to participate! We decided this month to focus on the part of the scripture that says "That I am." During Christ's life on this earth He taught of love. He showed the single greatest act of love that anybody has every shown. Christ brought to pass the Atonement. An act in which enabled all of mankind to be able to return to live with our Father. Without this Atonement we would be left to our own carnal state and be condemned to destruction by justice. However, since Christ was perfect He was able to pay the debt He did not owe, because we had a debt we could not pay. It is prophesied by prophets through the Bible, and Book of Mormon, as well as by modern day prophets, that Christ will come again to redeem his people. I haven't seen the nail prints in his hands or feet, nor have I talked with him face to face during this life, but I do know that he plays a part in my everyday life. I know He lives. I know He lives today. I can see the evidence in my life. In the way the sun comes up in the morning. I can hear it in a baby's cry. I can see it in the kindness shown by strangers, and the love shown by families. I can see it in the way the flowers grow, how the snow falls, and in the way He lights up the sky with diamonds. I first gained this knowledge when I prayed to ask if He was aware of me. I got an answer more powerful than I can explain. No, I wasn't visited by angels, I didn't hear a voice, or have a vision, yet the answer I got to that prayer was nevertheless powerful. It was just a simple peaceful feeling. A warmth in my heart that let me know that He was indeed there and that He was aware of me. This is one of my very favorite songs about the Savior. For more about the artists in this song please visit www.notesofglory.com. I know that He lives. I know that he loves me more than I can even comprehend. I know that he is all-knowing and almighty. Because I have this knowledge I trust Him to direct me in my life and I know that if I follow Him I will always remain on the right path. I also know that if I ever slip up and make a mistake that His hand will always be stretched out towards me ready to pull me back up. I believe in Christ. I believe in all that He has done. I believe that there are many great things that he is yet to do. I also believe that He remains a part of my everyday life and that He lives today. As part of our social media challenge we ask you to share your testimony about Jesus Christ with the world through social media. 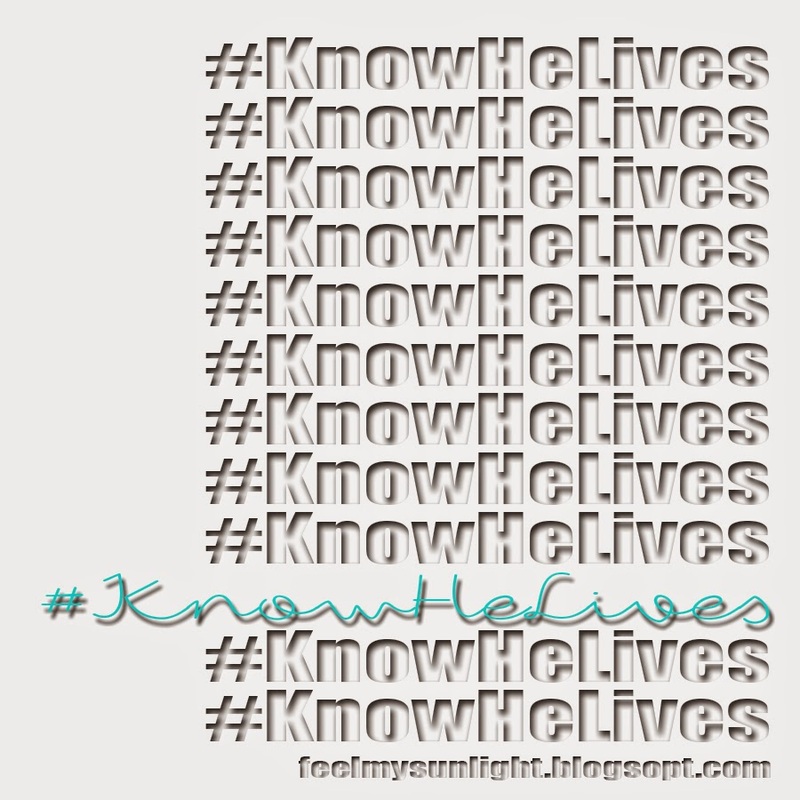 To do this we challenge you to post quotes, scriptures, pictures, and personal testimonies to Twitter, Facebook, Instagram, and any other of your favorite social media sites and don't forget to use the hashtag #KnowHeLives. Help us spread the good news of Christ with the world. I love you all and want you to never forget that Christ loves you and is aware of you. Also, shout out to Noelle Bybee for crushing it in the blind auditions on The Voice the other night. Noelle and I used to tumble together back in the days of velvet leotards. We're rooting for you Noelle! Look how cute we are in our velvet leotards. Buy her audition song HERE!